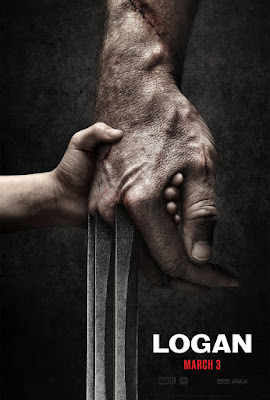 You know I was dreading to go see this and not because I don't like Wolverine, I'm just kinda tired of seeing his story. I mean he's not the only superhero in the X-Men franchise but I digress. I guess Marvel is fixated with this dude. Here mutants are pretty much non-existent or hiding. Logan is a man who despondent and makes his living as a limo driver, he is also drinking his life away...he a drunk ya'll. He doesn't get into any confrontation (or tries not too) and drinks, dats pretty much it. Logan just wants to be left alone. He is also taking care of and protecting Professor X. Trouble starts for Logan when a woman who wants him to help her with a girl we assume is her daughter at the beginning of the movie. Logan is having none of that though and is only dragged into the fore-fray when he can no longer avoid it. I was pleasantly surprised by the movie, it was action packed and the story line was good. Logan pretty much takes the task of protecting this girl, Laura who was part of a government experiment and has his mutant powers...she's him 2.0, maybe more. The movie is a bit long and has a slow build up to the action but it's worth it. The young actress who played Laura was great and the chemistry between her and Hugh Jackman was almost too perfect. I don't want to give too much away but I will say the movie worth the money spent. The ending was sad but I wondering if we gonna get another Wolverine movie.....but with Laura as the main character. it's good...honestly good. I was really in the theater with a attitude at first, lols.